I checked on my boss's house today. He's been travelling for 3 weeks now. He said the water bill was a little high last month which made him worry because a few months ago he had a major water leak while he was gone. I looked around the house and everything looked ok until I went in to the second bathroom. The toilet was running. You know that sound, the trickle of water leaking out and the continuous hiss of water as the tank tries to fill. I tried a few adjustments but they didn't fix the problem. I think it needs a new flapper. I decided to shut the water off behind the toilet and let my boss deal with it when he comes back. I went outside and looked around the yard. The waterfall for the pool was on. I wasn't sure if that was supposed to be on but he has a pool cleaning service so I didn't bother messing with it. I did fish dead mouse out of the pool. That was just icky. When I went back inside, about 15 minutes later, I checked the toilet. The back had drained. Hmmm, I'm guessing it is a low flow toilet and it might hold 1.6 gallons of water. 1.6 per 15 minutes is 6.4 x 24 hours x 7 days a week = 1,075 gallons a week! Gee, if I had a water source that gave me 1,075 gallons a week I wouldn't have to conserve rainwater anymore. Anyway, I filled 17 old iced tea gallon jugs with drinking water so I am set for another two or three months. 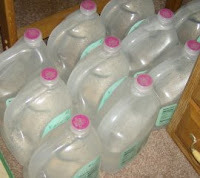 If that amount of water will last you 3 months, do you think you are drinking enough water? My mom doesn't think I drink enough water either. I know I don't drink enough but I don't like the taste and I don't feel well after I drink it. I have only started drinking iced green tea this summer. I try to eat fruit like watermelon too. I probably shouldn't mention that half of that water is for the cat. You have reminded me that I was going to try to make my own iced green tea so now that I have a water surplus I am heating some now. It would definitely be cheaper if I was a water drinker. Even store bought water is a lot cheaper than pre-made tea or juice.